Disocver Your Knee Replacement Surgery Options. The decision to have a knee replacement is rarely spontaneous. It comes after months and years of steadily increasing knee pain and stiffness. Maybe it started long ago, and now it just seems unbearable. Well, you don’t need to continue to live with the knee pain. Orthopaedic surgeon Dr. John R. Moore and his staff offer relief from the pain with total knee replacement surgery at their surgical center in Pinehurst, NC. This surgery can help you live an active life without constant pain. If you are interested in a knee replacement to reduce your joint pain or improve its function, call our office in Pinehurst, NC at (910) 295-0224. We proudly provide knee replacement surgeries to patients from Fayettevile, Laurinburg, Pinehurst, Sanford, and beyond. Knee replacement surgery is a procedure to reduce pain caused by arthritis or other conditions in the knee joint. As we age, cartilage in the knee can be worn away, resulting in inflammation. The process is usually gradual and may take months or even years for it to progress from a mild to a severe level. In a knee replacement at our Pinehurst, NC surgical center, Dr. John Moore replaces the hinged joint of the knee with a metal-on-plastic artificial knee joint. He performs both total Knee replacement and revision knee replacements. 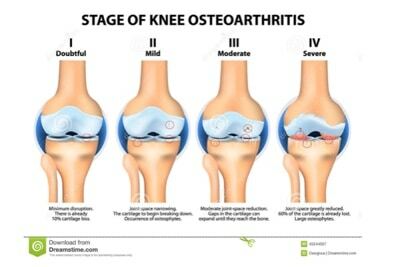 Osteoarthritis of the knee joint is a degenerative type of arthritis that most often occurs in patients 50 years or older. It occurs when the cartilage of the knee begins to wear away gradually joint space between the bones of the knee joint decreases. As this occurs, X-Rays will reveal bone on bone in the knee joint. Osteoarthritis develops at a slow pace with increasing pain over time. Avascular Necrosis is a condition that occurs when bone loses blood supply. Blood is required as our bones are living tissues, when the supply of blood is interrupted, the bone begins to die. If the blood loss is not stopped or treated, the bone will collapse. Post-traumatic arthritis is another common form of osteoarthritis caused by a previous injury or another form of trauma. This type of arthritis can occur in any joint such as hip, knees, shoulder, and elbow. Over time the arthritic process will increase in severity and patients will have increasing pain and decreasing function which is no longer managed by conservative measures. At this point, it is time to consider a total knee replacement seriously. The decision to perform the surgery is usually based entirely on the patient’s complaints. Do I Have Alternative Treatment Options? In the early stages of the knee disease, the pain and loss of function may be improved by conservative treatment options. These options may include nonsteroidal anti-inflammatory agents, intra-articular injections of steroids, or visco-supplementation (a series of injections to the knee joint). In the end, the decision for surgery comes down to the patient’s tolerance for pain. What is the process for knee replacement surgery? The knee is a hinged joint that connects the lower end of the femur or thigh bone and the upper end of the tibia or shin bone. Articular cartilage covers the surfaces of each of the bones. The hinged joint has an additional component in that the knee cap or patella rubs on the anterior end of the femur. This serves as a fulcrum for the quadriceps muscle which straightens the knee. In a total knee replacement, the end cap of the femur is removed and replaced by a metal shell made of either titanium or a combination of chromium and cobalt. In a total knee replacement, the end cap of the femur is removed and replaced by a metal shell made of either titanium or a combination of chromium and cobalt. The upper-end cap of the tibia is replaced by a surface made of high-density polyethylene or plastic that is attached to the bone by a metal plate. This process creates a metal-on-plastic artificial knee. Dr. Moore also replaces the portion of the patella that slides on the femur with a high-grade polyethylene surface. A previous knee replacement that has failed may also need an additional surgery called a Revision knee replacement. The most common reason for a revision knee replacement the loosening of the components from the bone or wear of the polyethylene liner. In this procedure, Dr. Moore replaces failed components from the original replacement with more modern implants. Knee replacement surgeries are very successful regarding its primary goal: pain relief. Approximately 90% of patients have near complete pain relief. Most patients no longer require the need for assistive devices to walk, though some patients do choose to use a single prong cane for safety and balance. After total knee replacement, our goal is for you to gain 90 degrees or more of flexion or bend during your first three months after surgery. For best results, it is crucial for you to faithfully follow your exercise and physical therapy program so that you can continue to gain flexibility and function of your new knee. Our goal is for you to achieve 90 degrees or more of flexion or bend during your first three months after surgery. Patients are surprised to learn your knee replacement joint will typically last for 20-25 years due to advancement in technology and materials. If excessive scarring or stiffness prevents you from achieving your goal, it may be necessary to have a manipulation of that knee joint. This process is a quick outpatient procedure to break through the excessive scar tissue to gain complete range of motion. Most patients increase their activity level dramatically after surgery. Patients are encouraged to walk, hike, ride a bike or exercycle, swim and even play golf. Unfortunately, we do not recommend sports that cause significant impact and twisting such as running, singles tennis or downhill skiing. For More information about Knee Replacement Surgery with Dr. Moore, contact our Pinehurst, NC office, call us at (910) 295-0224, or check out our orthopaedic surgery blog.